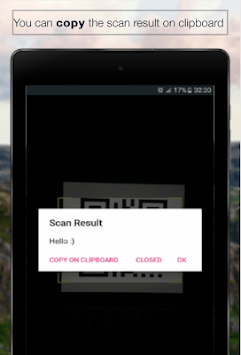 This free QR code reader and scanner application is the best for the Android Smart Phone. - Click the button and read your code. If click the "CLOSED", exit the application. * Scan a QR Code in a magazine and watch a video immediately. * This apps use the your camera and scan the barcode. * There is a simple interface. * Your phone does not tire. * Does not consume your battery when scan the code. * QR code scanner works quick and smooth. It has quick scan capability. * When you scan the QR code, you can save the resulting clipboard. * A text may appear in the result of the QR code scan and you can send your friends via message this text. * Result may appear url, you can copy the clipboard and past the google and then search the internet. * QR Scan has quick scan properties. * You can use this scanner as scan for whatsapp Place the camera on the Whatsapp QR code and wait for the scanning. So you can access WhatsApp web. * Share resul, using facebook or twitter. * You can use as wifi QR code scanner. 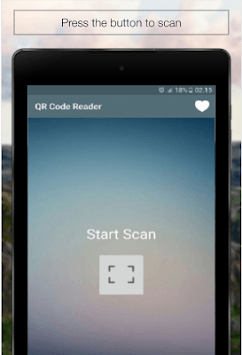 * Once you have make your own qr code and then you can test the code with this app. * Scan Aadhar card barcode. * Enigma QR code reader. * Reliable for professional use. * Supported by updates and it gets better. * It can work offline.Internet connection is not required for scanning. * The safest QR Code browser with a few permission given. * The real application made for you.